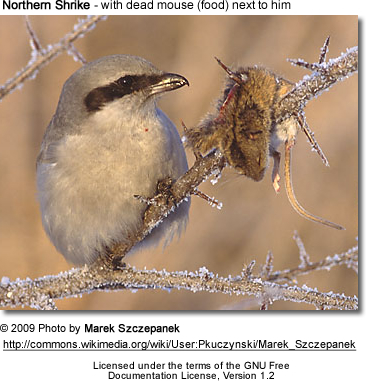 The Great Grey Shrike or Northern Shrike (Lanius excubitor) is a member of the shrike family. 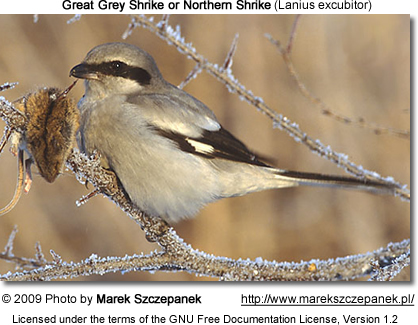 The Great Grey Shrike breeds in northern Europe, Asia and in North America in northern Canada and Alaska, where it known as Northern Shrike. It is migratory and winters further south in those continents, too, for example, Great Britain and the northern USA. Wintering birds usually arrive in October and November. As a rule they are then solitary, and when several arrive simultaneously they speedily spread out, each establishing its hunting territory and reducing competition with others. The Great Grey Shrike is 22-26 cm long. The general colour of its upper parts is pearl grey; a stripe above the eye and the cheeks and chin are white, and a deep black streak extends from the forehead, through the eye, to the ear coverts (feathers covering the ears). The scapulars (shoulder feathers) are white and the wings black and white, with one or two white bars. The under parts are white, slightly tinged with grey. The bill is nearly black, pale at the base of the lower beak; the legs are blackish. Though it uses its feet to hold beetles or flies, it has other methods with larger prey such as lizards, mice, shrews and birds. These when captured are impaled upon a sharp point, such as a thorn or the barbs of barbed wire. (Please refer to photo above.) Thus secured they can be ripped with the strong hooked bill, but its feet are not suited for tearing. Typically, half the prey consists of small mammals.